Roosevelt Island has always been a curious area of New York City. While it's technically part of Manhattan, it is a narrow island in New York City's East River. The whole island is only two miles long. At its widest point, it's only 800 feet. Throughout its history the island mostly housed hospitals and prisons. There was even a smallpox hospital for contaminated, contagious patients that the the rest of the city's population didn't want to rub shoulders with. Today you can still visit some of those historical sites (a lighthouse is definitely worth the visit!) but most of the island is now full of apartment buildings, restaurants, and beautiful parks. You can stroll the East River and take in views of Manhattan and Queens. It's the home of numerous special events from firework shows to festivals. With Roosevelt Island, the journey is as impressive as the destination. A tram takes you to and from the island giving you unobstructed, breathtaking looks at the city. It's so special locals ride it for fun or special occasions like birthdays or anniversaries. The two-mile island is located in the middle of the East River. It is parallel to Manhattan's East 46th to 85th Streets. From Queens you can get to the island via the Roosevelt Island Bridge — the only way to walk or drive onto the island. Its entrance is Vernon Boulevard & Main Street in Astoria. From Manhattan, take the tram from E 59th St. and Second Avenue. It costs $2.25 to ride each way ($4 round trip), and you can pay using a MetroCard. The views are spectacular! (Note: The tram only runs Sunday through Thursday: 6 a.m. - 2 a.m.; Friday and Saturday: 6 a.m. - 3:30 a.m.) You can also reach the island via the F train. In 1973 Roosevelt Island was named after President Franklin D. Roosevelt (a New York state native) as an honor. But the island hadn't always been a place with which someone so distinguished would want to be associated. Throughout the 19th century the island housed New York City's undesirables. There was a penitentiary on the island and a hospital to serve the needs of those inmates. There was a lunatic asylum, a workhouse to hold those convicted of lesser crimes, and a smallpox hospital. A lighthouse, named the Blackwell Island Light, was built by convicts and still stands today. In the second half of the twentieth century the island started being used for different purposes. The United Nations headquarters opened close to the island, and many dignitaries wanted to live close to work. Prestigious architect firms created apartment buildings to house over 20,000 residents. A park, named the Frank D. Roosevelt Four Freedoms Park, was created for recreation. The tram was built and the later the subway station. Now the island is the base for many different projects. Cornell created a tech campus there that opened in 2017. In June 2015 Hillary Clinton officially launched her Presidential Campaign on the island. There are numerous art museums and studios. 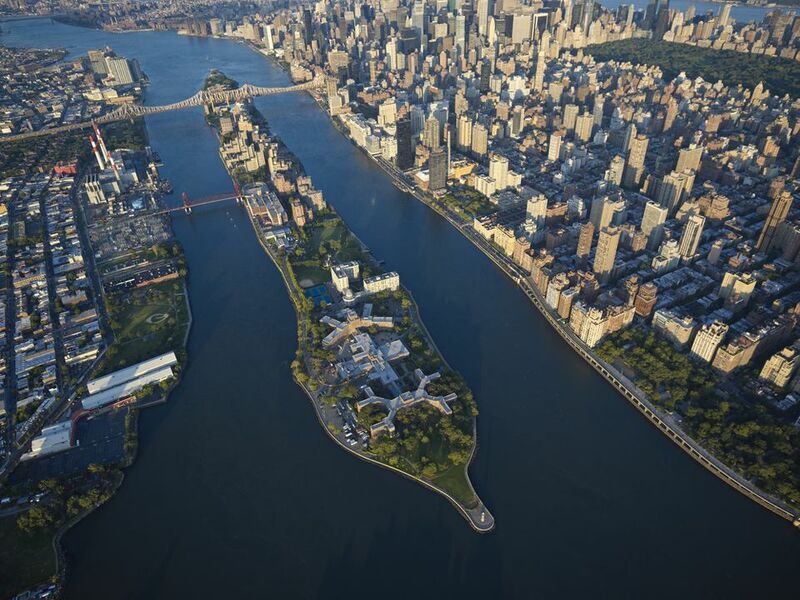 On the southern tip of Roosevelt Island is Franklin D. Roosevelt Four Freedoms Park. It's a memorial to the late President and is inspired by his famous Four Freedoms speech that he gave as part of his 1941 State of the Union Address. It was also the last work of the late Louis I. Kahn, a famous architect of the 20th century. It is free to walk around the 4-acre park and see parts of Roosevelt's speech inscribed on granite pillars. It also provides an excellent view of the United Nations building across the river. Art lovers should head to Rivaa, Roosevelt Island Visual Art Association. The gallery shows the work of local artists in addition to international guest artists. Painters, sculptors, computer artists, graphic designers, ceramists, and installation artists all show their masterpieces there. It's open Wednesdays and Fridays 6-9 p.m. and Saturdays and Sundays 11a.m.-5 p.m.
Roosevelt Island holds numerous seasonal events. There is cherry blossom festival in the spring, a family-friendly arts festival in the fall, a Halloween parade, a tree lighting ceremony, July Fourth fireworks, outdoor film screenings in the summer, and more. Roosevelt Island Operating Cooperation updates the schedule regularly on its website. If you're visiting in the summer don't miss Roosevelt Island Day in June, a day dedicated to celebrating and enhancing the island. Entire families assist in beautification and clean-up projects. There is also a festival with carnival games and rides, food, live music, giveaways, and more. Information booths around the island teach visitors more about this beloved city treasure. Franklin D. Roosevelt Four Freedoms Park also holds special activities for the entire family. The majority of their events occur May to October and include lectures, film screenings, festivals, live music and more. There is a growing restaurant scene on Roosevelt Island. Most of the restaurants are congregated on Main Street. Bread & Butter is a market that has everything you could want: sandwiches, salads, burgers, pizza and soup. You can eat there or take it to the park for a picnic in the sunshine. Another place to pick up snacks is Wholesome Factory, a grocery steps away from the tram that is known for their omelets. Fuji East Japanese Bistro has more than 70 different sushi rolls from which to choose.